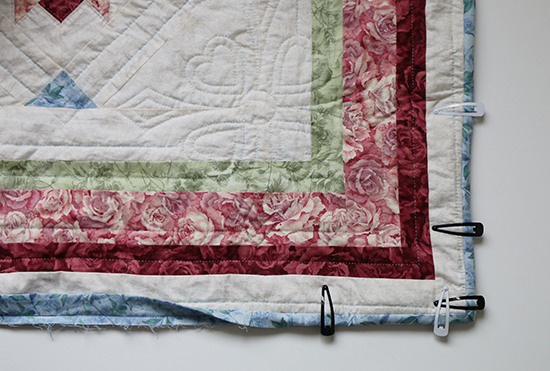 I was expecting to write about the progress I made at Quilt Night, hand-stitching the binding onto my queen-sized quilt, but the weather delayed us again. We didn’t have freezing rain this time, but there was enough ice already on the roads to make driving treacherous. We’ve rescheduled our holiday-themed get-together for well into January. Meanwhile, I have been working slowly on the binding at home. I’m about a quarter of the way around the quilt. It feels good to make progress, but it doesn’t make for exciting photos or blog posts. I’ve also been making headway on the pastel-colored socks that I started last week. The first sock is complete and I’m on to sock number two! The pattern is simple, which makes for quick knitting and generally error-free progress. And after all of the back-and-forth on colors last week, I’m still happy with my decision for the final color combination. If you look closely, you may notice that the pink yarn has more of a texture to it than the multi-colored yarn does. 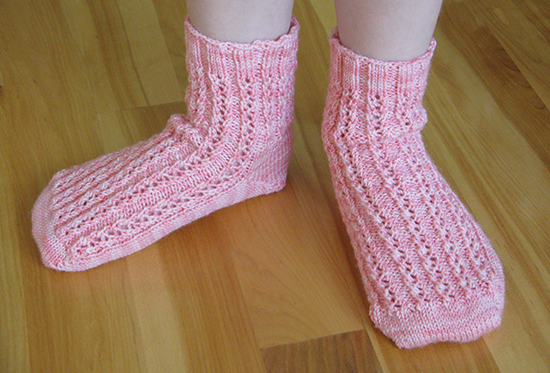 In 2009, I used the pink yarn to make socks for my daughter. By 2013, the socks were outgrown but the yarn was still in excellent shape, so I frogged the socks to reuse the yarn — and this is that yarn. Despite a few good soaks, it’s still holding some of the shape from the previous stitches. The color has also dulled a bit with use and washing. 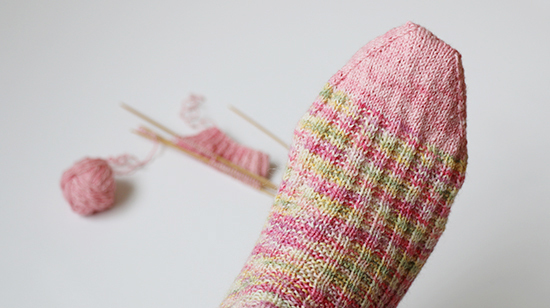 The history of the pink yarn makes the new socks a little extra-special for me. I’ll remember the yarn on those little feet every time I wear the socks.